Ah, the late 70s: a time when ‘superbikes’ were naked brutes, and more cylinders were the order of the day. 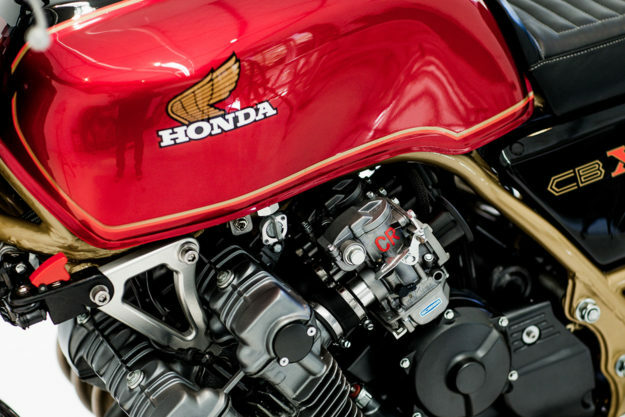 And the Honda CBX is the poster child for that era. 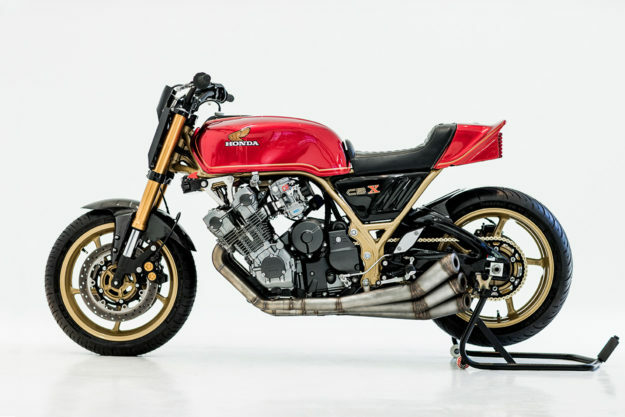 Powered by a 1047cc inline six, the CBX punched out 105bhp. It was an insane figure back then, and still respectable by today’s standards. Except—like most muscle bikes of that era—the running gear couldn’t quite match the ferocious power plant. 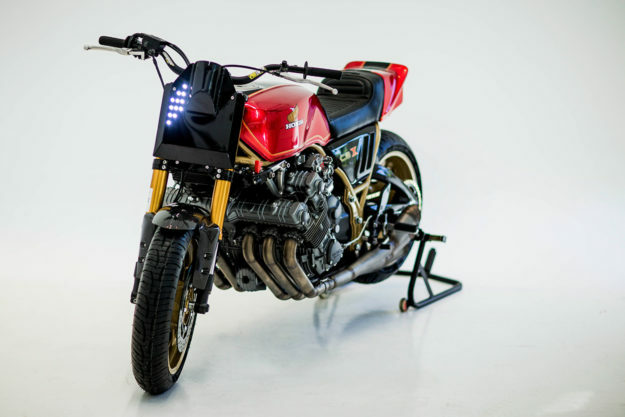 German Karp and Federico Lozada were well aware of this when a 1979 CBX landed on their bench at Herencia Custom Garage in Argentina. 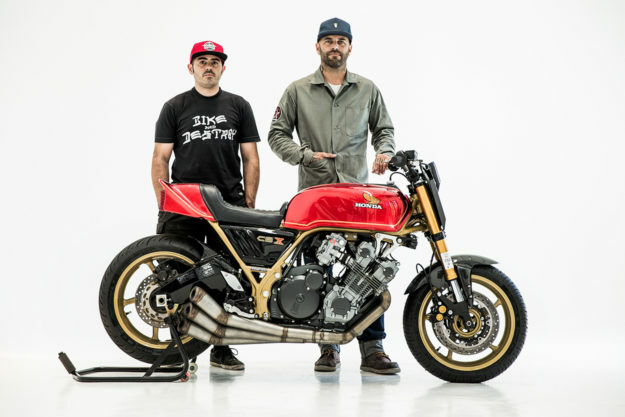 Herencia wanted to turn the old sportbike into a modernized street fighter. So they got their hands on the front and back ends of a Yamaha Fazer8, and set to work. The guys also had to widen the rear of the frame to slot the new swingarm in, and build new suspension mounts for the monoshock setup—which is now height adjustable between two settings. While on the frame, Fede and German cut off the original motor mounts, replacing them with custom CNC-machined brackets. And they added reinforcement to the rear end, to eliminate any flex. With the bike now rolling, turning and stopping better, Herencia turned to the engine. On went six new Keihin CR carbs: “because the old ones were over thirty years old,” quips Fede. That brutal, six-into-six exhaust is a stainless steel affair, and brought with it another set of challenges. 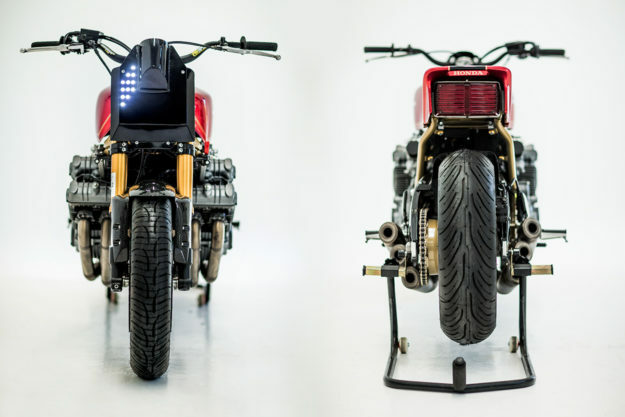 “The route of the pipes forced us to relocate the side stand to the front of the bike, using the crash bar holes on the motor to fit the new side stand,” explains Fede. Next up, the electrics were simplified and treated to a lighter Lithium-ion battery from Antigravity. 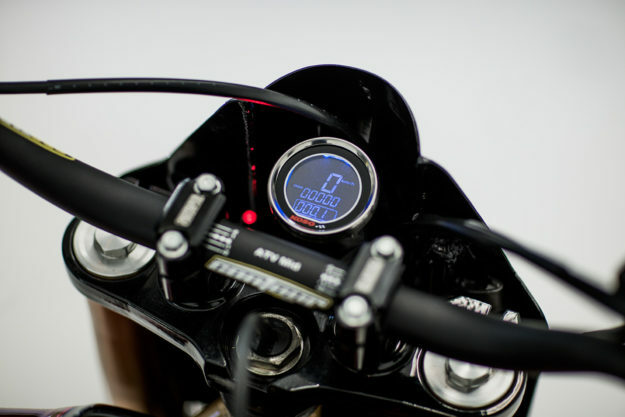 The bike now powers up via an aircraft-style on/off button on the oil cooler mount, and starts via a push-button on the left side cover. Everything else is handled by mini-switches on the bars. Herencia kept the original bodywork—but tweaked it. The tank’s got the cap and vent from a smashed Honda VFR400. And the tail’s been shortened and capped off with a custom-made leather seat. Even the big, square taillight is still present. The headlight arrangement’s new though—an aluminum shroud powered by twelve LEDs. 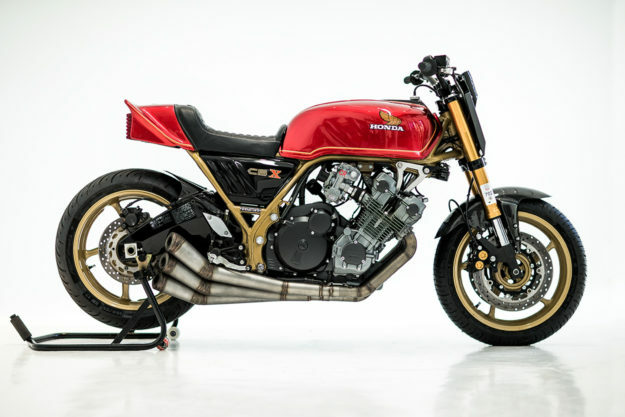 Yes, it’s a little futuristic, but we love the way it complements the CBX’s muscular stance. Tucked behind it is a Koso speedo, and a set of ProTaper clamps, bars and grips. The hand and foot controls were borrowed from the Fazer too, with the latter attached via custom linkages. 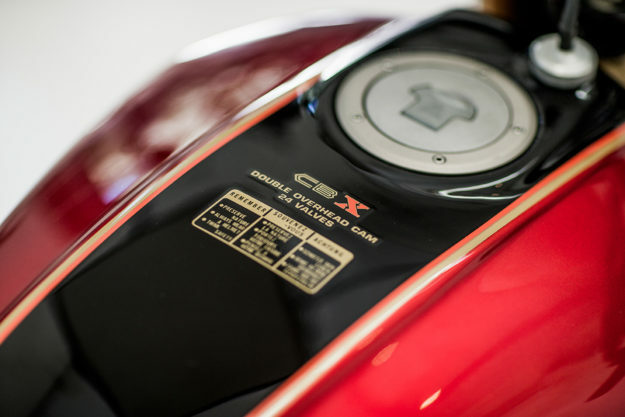 Herencia have seen to every little detail, like adding a discreet Lexan shield in front of the rear tire, or machining a one-off rear chain ring to fit the Fazer wheel. 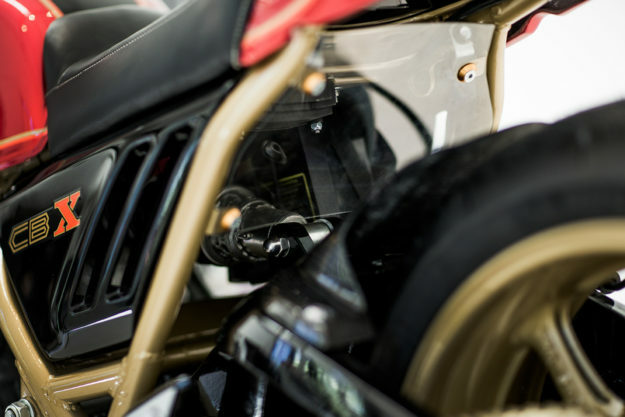 But it’s the use of the original bodywork that gets us—and that show-stopping red and gold finish. Factor in the Michelin Pilot Road tires, and you’ve got us pining for a quick spin.